One week after immersing audiences in a surreal dose of existential social commentary, "Halloween Hangover" — the second and final instalment of Unsound's Halloween special — straddled the natural and the supernatural with mixed results. Kicking off the night on a witchy note, Poland's Księżyc (Polish for "moon") handled the opening set with headliner magic. Flanked by a trio of men that switched between accordion, clarinet, keyboard, violin and computer processes, vocalists Katarzyna Smoluk-Moczydłowska and Agata Harz stood before a table set with chalices and bowls that proved equally suitable for drinking out of and turning into musical instruments. When they weren't breaking to play catch with a giant orb or wander through the audience with lamps (investigating under patrons' seats without explanation), they were swaying under a light bulb pendulum, casting spells in whoops and wails and looping meows from a child's sound book, their laughs swirling about the room like distant memories. It was folky experimentalism at its best, and the most captivating display of the night. If Księżyc's ritualism brought the pagan fix for post trick-or-treating withdrawal, the program's populist paean to the paranormal feeding frenzy of Stranger Things felt like an actual Halloween hangover. On the Netflix show, Kyle Dixon and Michael Stein provide the pulsing soul to the action, their synth-heavy compositions adding mood and intrigue to the nostalgic drama onscreen; but removed from the serial sci-fi and absorbed from an upright, seated position, their hazy keyboard drifts hardly made them Dungeon Masters orchestrating the scene. Stationed behind a darkened console of synths, laptops and electronics for their live set-up, the visual focus was dumped on a pulsing show of light tubes and strobes designed by MFO, and while the spectacle provided some dazzling visual moments, something felt lost in translation and the ambling atmosphere became exceedingly tedious. Even in the post-binge glow of Stranger Things Season 2, it was a struggle to pay attention, leaving the audience in an Upside Down dream. 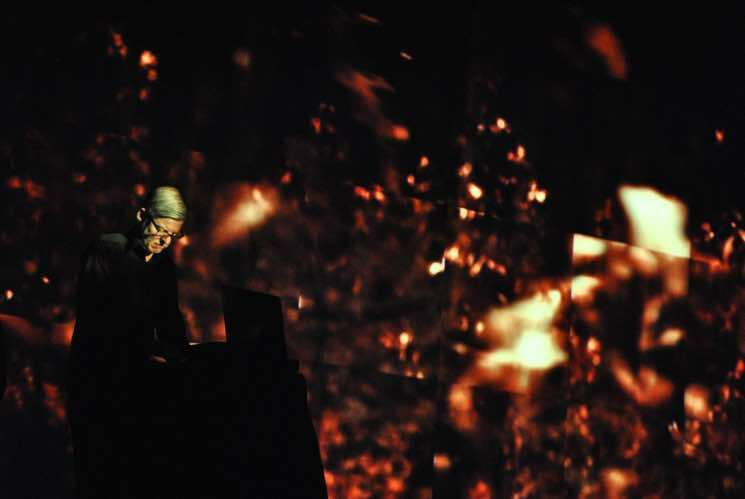 Inspired by the deep forests of Germany, ambient techno legend Wolfgang Voigt's GAS hijacked the tracking control for the finale, guiding the audience on a more effective, high definition retreat into the wilderness of the mind. Building on the posh, symphonic ecology of Narkopop, the first GAS release in 17 years, the audio-visual performance immersed the room in abstract, synthetic renderings of organic sounds while stylized video footage of woodlands played out behind Voigt on a screen, repeating and patterned as if wrapping the audience in a thick blanket of glorious flannel. Emphasizing the symphonic over the abstract, of anything in GAS's catalogue, the sonic world occupied by Narkopop is perhaps GAS's best-suited for the chic setting of the Bluma Appel Theatre, but as enveloping and immersive as the display was, the room's acoustics prevented it from reaching its true heights. As the heavy bass palpitations reverberated like the concentric rings of a tree trunk, they eventually met their ceiling with poetic aggression, rattling the light trusses with material contempt.